Assoc. Prof. Eleanor Wong, Director of the Legal Skills Programme at the NUS Law School shares how she used Google Docs to aid in improving her students' writing. Posted in Faculty Voice and tagged google docs, law, writing on 20 August 2009 by Kenneth PINTO. 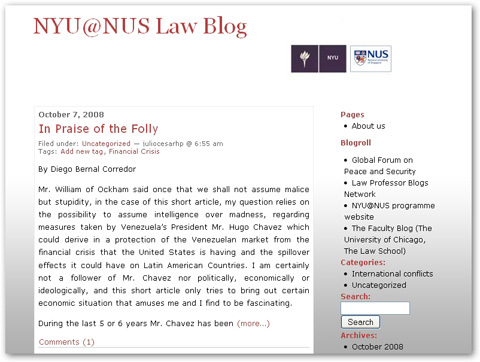 Added the NYU@NUS Law Blog to the NUS Web 2.0 Directory at Wiki.nus. Posted in Blog and tagged law on 8 October 2008 by Kenneth PINTO.